What are the signs and symptoms of it? 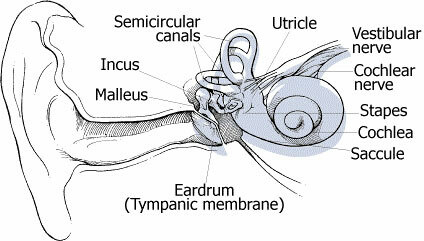 Glands in the skin of the outer part of the ear canal make earwax (also called cerumen). The wax traps dust and small particles to keep the ear clean. It also helps keep water out of the ears. The ears clean themselves of wax. You should not have to clean them. The wax builds up a little, then dries out and falls, or is wiped, out of the ear. Without wax, the ears become dry and itchy. A normal amount of earwax is healthy. Cotton swabs (such as Q-tips) are not recommended for cleaning. If you feel you must use cotton swabs, use them no more than once or twice a week. Impaction means that several layers of earwax have been pushed together and may be stuck in the ear. Normal wax builds up in the outer part of the ear canal, not near the eardrum. If a patient has build-up near the eardrum, it is usually because the wax has been pushed there. Patients who are trying to clean their ears with a cotton swab (Q-tip) or twisted tissue sometimes actually push the wax deeper into the ear. This not only can cause wax build-up, but it can injure the thin skin of the ear canal. Anyone can get impaction, but it tends to be more common in certain ethnic groups. People with narrow ear canals are more likely to get it. People who use cotton swabs in their ears are more likely to get it. You may try ear drops at home before calling a doctor. Eardrops soften the wax so it comes more easily out of the ear. Some drops can be found over-the-counter, such as Debrox or Murine Ear Drops. A mixture of 1 part hydrogen peroxide and 1 part water (or equal amounts) can also be used. You can use several drops twice a day. Tilt your head to one side and fill the ear canal using an eyedropper. Let soak in for a minute or two. Do this to the other ear if needed. Do this up to two times a day for 3 to 4 days. After 3 to 4 days, follow the same steps once a day. If impaction is a frequent problem, put 2 or 3 drops into each ear once a week. Stop using the drops if it causes any discomfort, dizziness, or drainage. If home treatment doesn't work, call the doctor. To clean out the wax, the doctor might wash it out, vacuum it out, or use special tools to get it out. If the impaction does not improve with home treatment after 7 days, call the doctor. If you or your child have tubes in the ears, call your doctor before using drops, oil, or peroxide to clean them out. If impaction is a frequent problem, ask the doctor to suggest ways you can prevent it. Call the doctor if impaction does not improve after 7 days of home treatment. Earwax (or cerumen) traps dust and small particles to keep them clean. The ears clean themselves of wax. You should not have to clean them. If you feel you must use cotton swabs, use them no more than once or twice a week. Impaction means that several layers of earwax have been pushed together. If a patient has build-up near the eardrum, it is usually because the wax has been pushed there with a cotton swab or twisted tissue. If your ears feel plugged or if your hearing is muffled, it could be a sign of impaction.